Welcome to Jimmy’s Cleaners. With 5 locations serving you in Franklin, Brentwood and Spring Hill. We are the proud winners of the 2016, 2017, and 2018 FranklinIs Sizzle Awards. Click Here for exact location addresses and contact information. 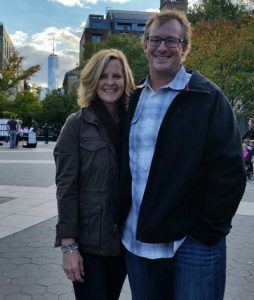 In 2003, Jimmy’s Cleaners was opened by Jimmy & Luanne Story of Franklin, TN. Starting with one drop store/plant in Spring Hill, TN, Jimmy’s has now grown to service the Franklin, Spring Hill and Brentwood, TN areas via 5 convenient full service and drop off cleaning locations in Middle TN/Williamson County. We welcome you and your family to to ours! Along with general dry cleaning and laundry services, Jimmy’s also specializes in a highly regarded Pick Up & Delivery Service for corporate and residential clients. Ask us how to get started with free pickup and delivery services! Call (615) 599-3605 Fire and Water Restoration, Wedding Gown Preservation, Alterations and more. Household items including draperies, bed spreads, comforters, rugs, or other specialty items are also welcome. We always go the extra step to make sure that all your assets are given the proper amount of personalized attention and care when cleaning, pressing, or making alterations. We understand how important your clothing, linens, bed spreads, wedding gowns, and other possessions are to you. That’s why our professional cleaning, dry cleaning, and alteration service experts are fully trained and some of the friendliest in Middle Tennessee. 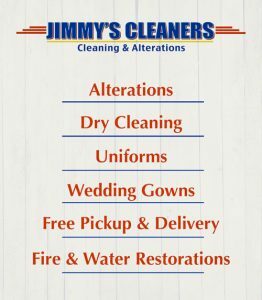 Jimmy’s Cleaners offers the Quality and Service you have come to expect from one of the area’s most trusted businesses!